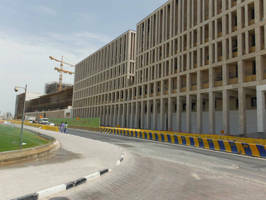 At the $5.5 billion 'Downtown Doha' development in Qatar, Grace Construction Products' Preprufe® waterproofing membrane has been specified to provide a proven, practical and reliable waterproofing solution. Said to be 'the world's first sustainable downtown regeneration project' and designed and built by Msheireb Properties, the country's leading sustainable developer, the 76 acre development aims to blend traditional Qatari heritage with modern, sustainable technologies. Preprufe® offered the perfect waterproofing system – combining outstanding watertightness, low environmental impact and long term performance with a fast, simple application in temperatures regularly topping 40°C. Starting on site in 2010, approximately 300,000m² of Preprufe® 300R waterproofing membrane has been applied to prevent water penetration and migration around the development's extensive substructures. With the final phases of construction set to commence in 2013, Grace will complete the application of over 600,000m² of Preprufe® 300R to keep the landmark project watertight and on course for its 2016 completion date. Designed with synthetic adhesive layers combined with a robust HDPE film, Preprufe® provides a permanent physical barrier that will protect each structure against chloride and sulphate attack. Grace's patented Advanced Bond Technology™ enables concrete to aggressively adhere to Preprufe®, forming a unique intimate seal to prevent any water migration between the waterproofing and the structure and substantially reduce the risk of leaks. No other system on the market protects a substructure from the harmful effects of water, vapour and gas more effectively than Preprufe®. It can be applied on wet substrates and is immediately trafficable after installation without protective layers, which makes for fast and easy application. When compared to traditional loose-laid PVC systems, Preprufe® is more than five times quicker – with approximately 500m² laid in one day compared to 60-100m² of PVC over the same time period. To complete the comprehensive application, Grace supplied 100,000m² of Bituthene® 8000 HC waterproofing membrane to deliver complete structural protection against the water table and aggressive ground conditions. When complete, the project will comprise over 100 residential and commercial properties that reflect the culture and aspirations of the people of Qatar. Designed to generate less waste, deliver long term cost savings and minimise its own carbon footprint, Msheireb Downtown Doha will become an iconic landmark in Qatar – whilst benefitting from the proven, market leading performance of the Preprufe® waterproofing solution from Grace. For further information on Grace Construction Products range of products visit www.preprufe.com or for general enquiries including technical, on or off site support, please email preprufe@grace.com. Grace Construction Products is a leading global provider of construction chemicals and building materials that are used to enhance the durability, strength and appearance of structures. Products include concrete admixtures, fibers, surface treatments and liquid pigments, additives for cement processing and masonry products, waterproofing, air and vapor barriers and fire protection. More information about Grace Construction Products is available at www.graceconstruction.com. The customer names mentioned within this article has been approved by the respective clients of W. R. Grace & Co.
PDMS Sheets and Membranes suit lab and medical applications. Membrane Electrode Assembly suits automotive fuel cells. Sterlitech's Membrane Flat Sheets comes with 5nm pore size rating. FiberTite temporary roof membrane is resistant to UV rays.